Luke Hunnings scored the winning goal for Deeping Rangers against Cogenhoe. 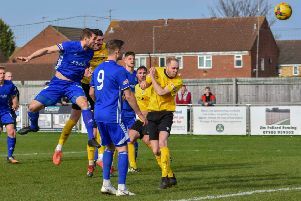 Ten-man Deeping Rangers kept their faint hopes of the United Counties Premier Division title alive with a last-gasp win over Cogenhoe at the Haydon Whitham Stadium today (March 23). Things started swimmingly for second-placed Deeping as Cameron Johnson opened the scoring with a glancing header on 13 minutes, but a useful Cogenhoe outfit equalised on 27 minutes before the hosts’ Dan Flack was sent off on the hour mark. Jack Bloodworth (stripes) scored for Peterborough Northern Star at ON Chenecks. But Deeping dug in and won the game in the 91st minute with a goal from centre-back Luke Hunnings. Johnson had earlier hit the bar. But it wasn’t all good news for Deeping who have been booted out of the UCL Cup after fielding an ineligible player in their 6-2 semi-final win over Daventry last week. The said player was a substitute sent on in the 94th-minute of a 95-minute match. Deeping remain nine points behind leaders Daventry in the Premier Division with a game in hand and the teams are due to meet on the final day of the season (April 27). Daventry scraped a 1-0 home win over Boston Town today, but third placed Rugby Town have fallen further off the pace after a 1-1 draw at Sleaford. Holbeach United and Pinchbeck United remain fourth and fifth after draws today. 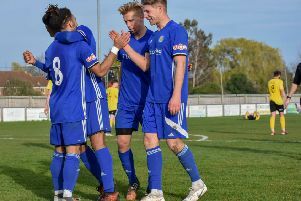 Pinchbeck twice led through Charlie West and a Lee Beeson penalty before accepting a point at Eynesbury Rovers, but Holbeach will be disappointed with a 1-1 draw at home with lowly Rothwell Corinthians. And it’s now 13 Premier Division games in a row without a win for Peterborough Northern Star. Jack Bloodworth scored the consolation goal in a 2-1 defeat at fellow strugglers ON Chenecks. Player-manager, and ex-Peterborough United player, Lee Clarke and Jones De Sousa were on target for Blackstones in a 2-1 Division One win at Sileby Rangers, while Bourne Town drew 0-0 at Birstall United. Stones are fifth, seven places clear of Bourne. March Town dropped a place to sixth in Division One of the Thurlow Nunn Eastern Counties League after a 2-0 defeat at Swaffham Town. Premier Division: Deeping Rangers 2 (Johnson, Hunnings), Cogenhoe United 1; Eynesbury Rovers 2, Pinchbeck United 2 (West, Beeson); Holbeach United 1, Rothwell Corinthians 1; Northampton ON Chenecks 2, Peterborough Northern Star 1 (Bloodworth). Division One: Birstall United Social 0, Bourne Town 0; Lutterworth Town 3, Huntingdon Town 1, Northampton Sileby Rangers 1, Blackstones 2 (Clarke, De Sousa). Division One North: Swaffham Town 2, March Town United 0.